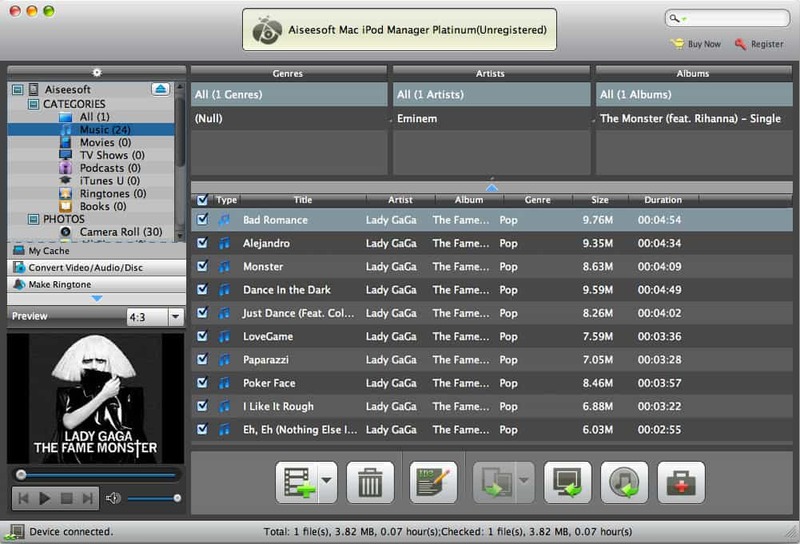 Aiseesoft Mac iPod Manager Platinum can help you export iPod music, movies, pictures, TV shows, Podcast, iTunes U, eBooks, camera roll, voice memos, and camera shot to Mac, and import local music, videos, ePub, PDF, and images to iPod without losing anything. Also it allows you to convert popular video/audio files to iPod compatible formats, then output them to iPod directly. Moreover, it is highly compatible with iPod touch 5, iPod nano 7, iPhone 5s/5c, iPad mini 2, iPad Air, the new iOS 7 and iTunes 11, etc. And it can also transfer files between different iOS devices(iPod/iPhone/iPad). With this software, users can even transfer iPhone SMS (MMS) and Contacts to Mac, and backup these files in this program. In order to backup your iPod files, Aiseesoft iPod Manager for Mac gives you the ability to mange your iPod files to iTunes. With this software, users can trim video length, crop video frame, watermark video, adjust video effect, and so on. This software can help you repair the iPod database if it is damaged. This software allows you to edit the ID3 info (name, artist, album, track number, lyrics, etc.) of your iPod files. Aiseesoft iPod Manager for Mac can help you to search your files in the categories of Name, Genre, Artist, Album for you to find your file as soon as possible. Click video, audio and photo folder, the number of the files will be shown in the bottom of the screenshot. This Mac iPod Manager provides users with the My Cache feature, which allows users to store the converted iPod files in My Cache temporarily. So you have no need to connect iPod to Mac while converting video files.